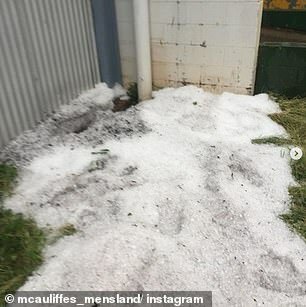 A teenager was horrifically struck by lightning on Tuesday night as severe thunderstorms, hail and damaging cyclonic winds continue to lash Queensland. The teenage girl, 16, was reportedly at a property west of Mackay when she was hit. She was rushed to a local hospital after suffering tightness in her chest and muscle pain, the Courier Mail reports. She reportedly saw the electricity coming toward her. Up to 20,000 properties are out of power, as the remnants of Tropical Cyclone Owen, which did not make landfall, continue to rock the east coast. Fallen trees on power lines have left 19,431 family homes without power, a spokesman from Ergon Energy said. 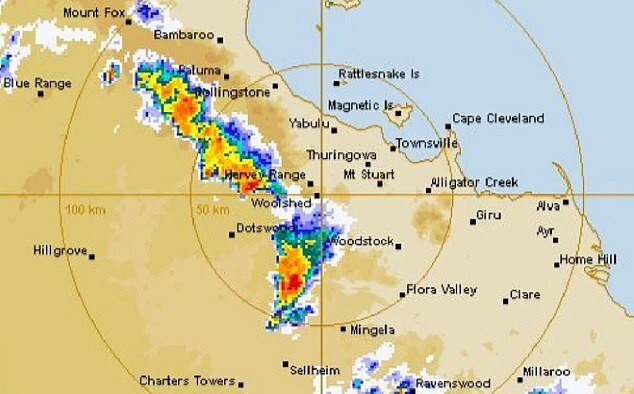 ‘We’ve had a combination of lightning strikes on parts of the network, and also trees and branches are down on power lines,’ an Ergon spokesman told the Courier Mail. 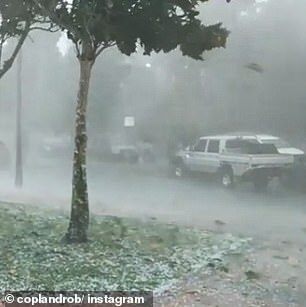 Hail storms lashed areas in Atherton, Northern Queensland, where up to 2cm of hail stones fell. 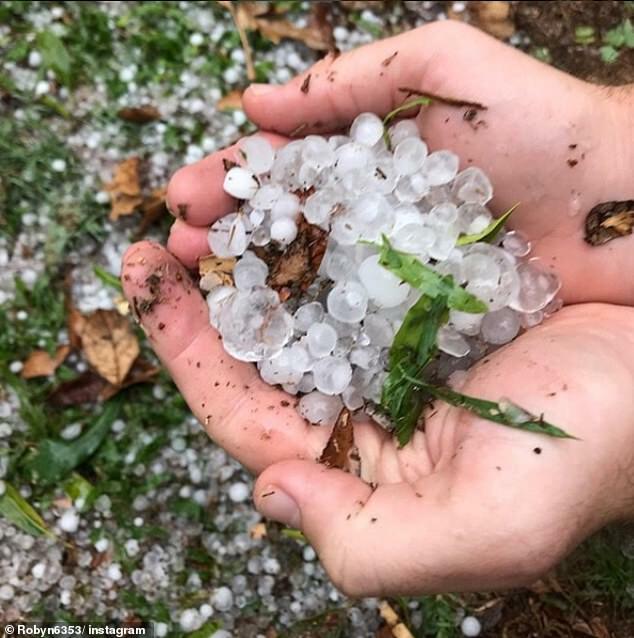 One woman named Robyn, from Atherton, shared a photo of large hail stones in her hands. ‘Two days in a row #hail #storm #hailstorm. No power at home now,’ she said. Yet some Australians have kept their ‘chins up’. Daniel Clarke, also from Atherton, resourcefully collected the hail to ice his beer in the backyard. 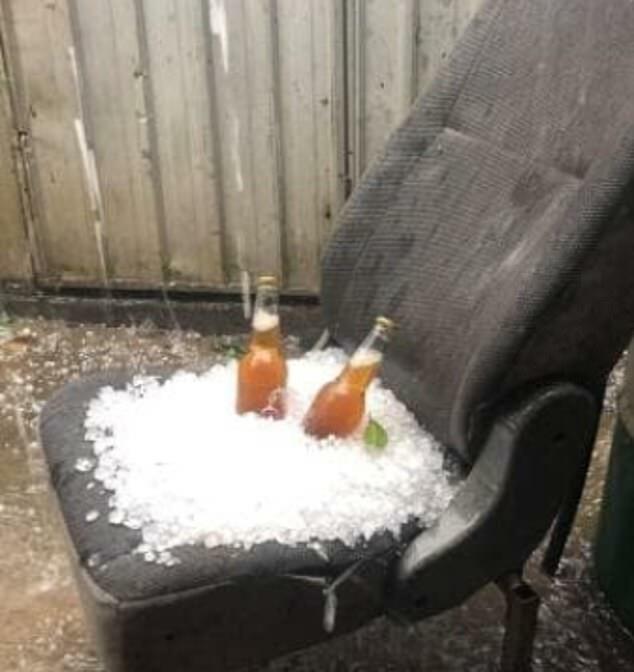 In a picture shared on social media, Mr Clarke shows what appears to be a car seat covered with a layer of hail stones creating a ‘natural esky’ for two bottles. 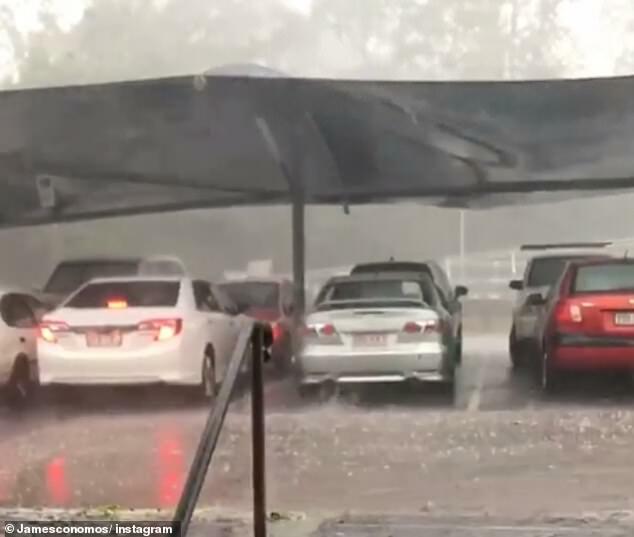 The Bureau of Meteorology (BOM) has since downgraded Tropical Cyclone Owen to an ex-cyclone. ‘Ex-tropical cyclone Owen is located over the northern Coral Sea and is moving slowly west. ‘We will continue to closely monitor the system in the coming days, however it is not expected to redevelop into a tropical cyclone. There are no other significant tropical lows in the region and none are expected to develop during the next three days,’ according to a recent BOM update.